Is there really such a thing as The Ultimate Chocolate Chip Cookie? Over three years, I’ve tried more than twenty unique recipes and countless variations and tweaks for one sweet little indulgence: a chocolate chip cookie. My goal, beyond satisfying Greg’s sweet tooth, was to determine which cookie reigned supreme. The results though mostly delicious were inconclusive. 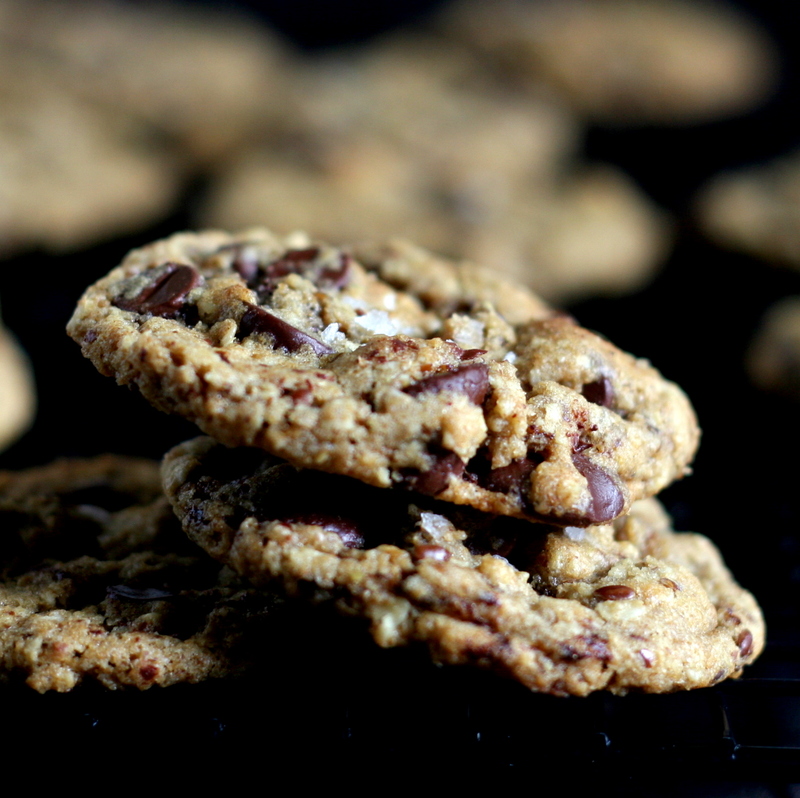 Somewhere between Jacques Torres’s New York Times recipe and the Neiman Marcus urban legend recipe, it hit me–there is no singular recipe that can satisfy all chocolate chip cookie lovers. Just as beauty is in the eye of the beholder, “ultimate” deliciousness is on the tongue of the taster. Sometimes, like when I catch a rerun of M.A.S.H., I’m overcome with a craving for an old school Tollhouse chocolate chipper with those thin, crispy edges that smack of caramel. My current favorite has a hint of cinnamon, the chew of oatmeal, a subtle crunch, and lots of good chocolate. (While the amounts and types of chocolate used in the recipes I tested varied, the authors agreed on one point: use the best chocolate you can find.) Yes, even my “ultimate” cookie is a moving target subject to change with the seasons and my state of mind. 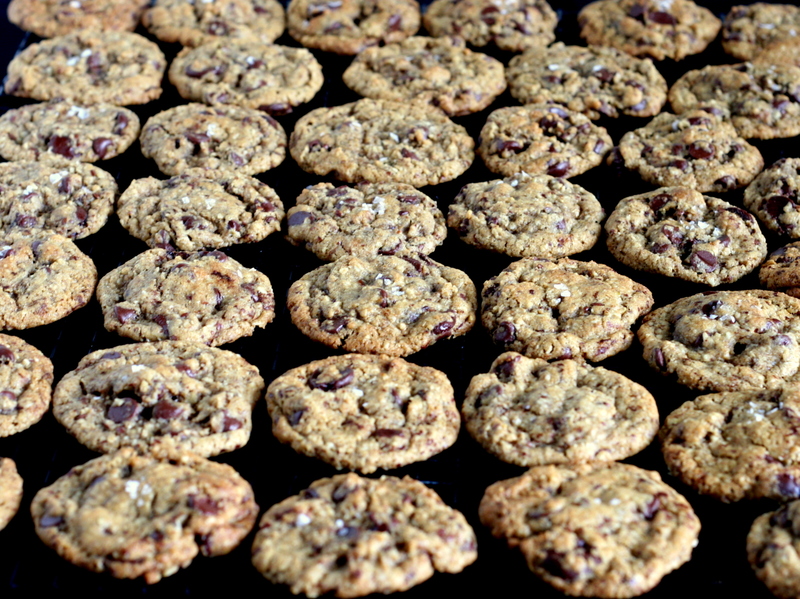 With that, I give you my current favorite–my ultimate chocolate chip cookie. It’s packed with chocolate. The wheat flour and flax seeds are used for texture and flavor and not their arguable health benefits. I don’t like a chocolate chip cookie that tastes like something other than, well, a chocolate chip cookie, but cinnamon and espresso powder are subtle additions that deepen the flavor in that “I don’t know what it is, but I like it” kind of way. Tell me about your Ultimate Chocolate Chip Cookie. Beat butter and sugars at medium speed in a heavy-duty mixer until creamy, about 3 minutes. In a food processor, pulse the oatmeal several times until it’s reduced to coarse crumbs. Combine ground oatmeal, flax seeds if using, flour, baking soda, and salt in a separate bowl. With the mixer on low, gradually add dry ingredients to butter mixture until just combined. Want even more chocolate in your cookies? Try these Double Chocolate Cookies with Mint. The photos great, and I know that the cookies taste awesome… wish I had one right now! I came across this recipe and everyone I have served them to loves them. What makes them unusual is that there are 3 kinds of sugar in the dough, white sugar, brown sugar and turbinado sugar, which gices them a little bit of a crunch. Plus, I make them with Lindt fleur de sel chocolate bars, chopped up (but no salt on top). Give them a try! Thank you! These look delicious! Who knows, maybe these will be my next favorite chocolate chip cookie.